I read this book for the first time as a 17-year-old trying to overcome personal demons. Written between 1968 and 1970, the book purports to be the diary of a 15-year-old girl fighting her own evil demons. Alice is not the name of the diarist, but a name that was 'chosen' to hide the identity of the author. Alice is a carefree, very intelligent girl who finds herself trying LSD for the first time to fit in with her new friends, after her family moves to a new town. Everything after that first 'trip' is a whirlwind, with Alice losing her virginity, running away from home, living on the streets, and meeting some very dangerous people. She makes a few attempts to return home and stay off of drugs, but she ends up going back to them again and again, sometimes willingly, other times not. One of the occasions where Alice relapses, she finds herself waking up in a mental institution, having chewed the tips of her fingers to the bone and scratching her face to get rid of the worms she thought were trying to penetrate her skin. She again tries to shed the dark life she has found herself living, only to find that once she rises above, she is torn down again by unfortunate circumstances that befall her. A very controversial book in the seventies, it was only speculated later that the book was not actually the diary of a young girl, but supposedly written by psychologist and Mormon youth counsellor, Beatrice Sparks. Sparks claimed to be the editor of the book, and compiler of the original diary that was taken from one of her patients who had gone through the same experiences as 'Alice'. No one knows the real authorship of the book, as it was never proven that the diary was written by the young girl, and Sparks never came forward to say so herself that she was the author. Whether the story is true or not, it is an in-depth look at what peer pressure and drugs can do to an adolescent mind. 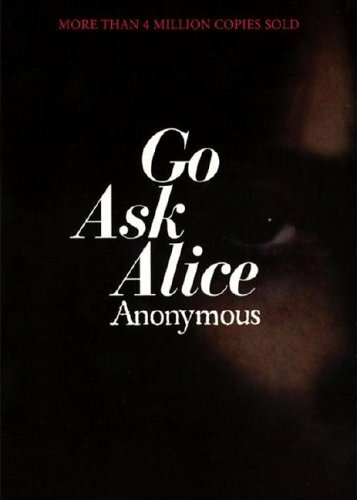 A very dark and disturbing read at times, one sees the struggle that Alice goes through daily with drugs, depression, and guilt. It is unsettling to know that many young girls (and boys) are forced to deal with these issues at some point in their lives, inevitably. As I said above, I read this book at a time in my life where I had just begun working on getting out of the same situation, so I could relate to what Alice went through. Into drugs, and deeply depressed, I fought to be 'normal' like everyone else who was 'enjoying' their teenage years. Just like Alice, I found myself in a hospital for kids who used drugs to self-medicate against what was really going on, and who were considered to be a danger to themselves. But I persevered, and what I went through as a teenager has only made me stronger, has only made me the person that I am today. But, my story will have to wait for another day. In the meantime, pick up this book if you can. Although it is a heart-wrenching story, there are points of light and hope. I highly recommend it.